What are 1000 Hour Ultra-thin Wax Strips? 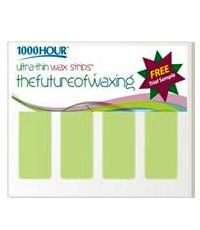 1000 Hour™ introduces a revolutionary line of Ultra-thin Wax Strips™ that are simple, fast, economical & convenient. Since the wax strips are super-thin, they are a lot less painful than other strip waxes and what’s even more appealing is that they leave no residual wax on the skin, therefore no clean-up lotions necessary. That’s why stripping off never felt so good. 1000 Hour™ Ultra-thin Wax Strips™ are the first of their kind to cater for different hair types: Fine to Medium Hair; and Medium to Coarse Hair. Enriched with Aloe Vera & Vitamin E to nourish the skin, is fragrance free and are hygienic single-use wax strips. 1000 Hour™ Ultra-thin Wax Strips™ come in three sizes – large, ideal for arms, legs & body; medium, ideal for underarms, bikini & body; small, ideal for face, lip, chin & touch-ups. There is no wastage – the wax strips are versatile, they can be used as a complete strip or cut down for delicate or specific areas. The innovative slim-line pack is perfect for storage & travel. 1000 Hour™ Ultra-thin Wax Strips™ are available for both Women and Men. Because waxing removes hair by the root, you’re left with a silky-smooth feeling that can last up to 4-6 weeks*. 1000 Hour™ Ultra-thin Wax Strips™ are easy to use and far more comfortable than you might imagine. Say goodbye to prickly stubble and sticky residue will become a thing of the past! This entry was posted in 1 and tagged 1000 HOUR ULTRA THIN WAX STRIPS, Fr3b, Free giveaways, free samples, freebies, S’pores 1st Sampling Concept Store, singapore’s 1st online sampling platform, skincare, WAX STRIPS, www.fr3b.com More stats. Bookmark the permalink. just tried the 1000 hours ultra yhin wax strips 10 minutes ago-so far the easiest waxing I’ve ever done. No sticky stuff left on skin-where can I buy it?